The Hall House Hotel is open 24/7, 365 days a year! The Hall House dates back to 1881 and is the second oldest building on Dahlonega's historic square. Frank Hall originally built the Hall House as both his home and a boarding house. Over the years it has served as a hotel, apartments for students of UNG and others, and as a single family home. Currently it is home to the Bourbon Street Grille, Bleu Art Gallery, Hall House Gallery, and the Hall House Hotel. 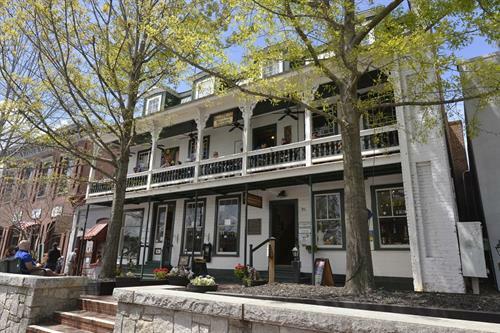 The Hall House Hotel is the only hotel directly on Dahlonega's historic square; a short walk to the restaurants, shopping, music venues and everything else Dahlonega has to offer! To view rooms & rates see our website for more information! Stay straight as US 19 N turns into S Chestatee Street. Turn right when it becomes Public Square. Turn left onto North Park Street and follow the signs for free parking in the back!